We are honored to be selected! Thank you to the Tucson Weekly Staff for selecting Odyssey Storytelling as the Best Way to be Entertained by Real Life Adventures in an Off-Broadway Setting in the September 2012 “Best Of Tucson” issue. 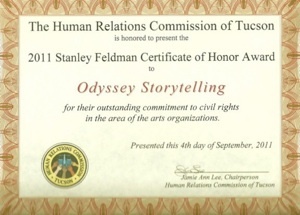 Thanks Human Relations Commission of Tucson for the 2011 Stanley Feldman Certificate of Honor Award! It is presented to Odyssey Storytelling "for their outstanding commitment to civil rights in the area of arts organizations." StoryArts Group is the happy recipient of a grant from the Tucson Pima Arts Council! Thanks TPAC for supporting Storytelling in Tucson! A project of the Tucson Pima Arts Council, in partnership with the business, government, and arts community. Honoring outstanding luminaries who have made significant contributions to the arts in our community. 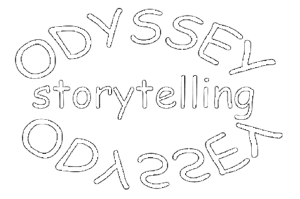 The only organization of its kind in Tucson, Odyssey promotes creative expression and community building through its monthly storytelling event and community workshops that explore a wide range of provocative and entertaining themes. It “celebrates the art of storytelling, a powerful medium for connecting diverse audiences and building community.